The public at large would hardly know about the Kingdom of Commagene if Karl Sester, a German engineer, had not queried his Turkish assistants about remaining evidence of the Royal Road which linked ancient Persepolis with the Aegean Sea. 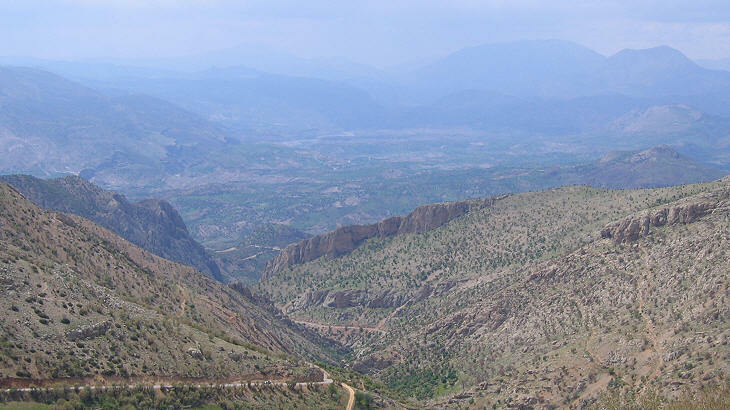 He did so because in the early 1880s he was assisting the Ottoman government in developing a new road in Eastern Anatolia and he thought that finding the route of the ancient one could be helpful. 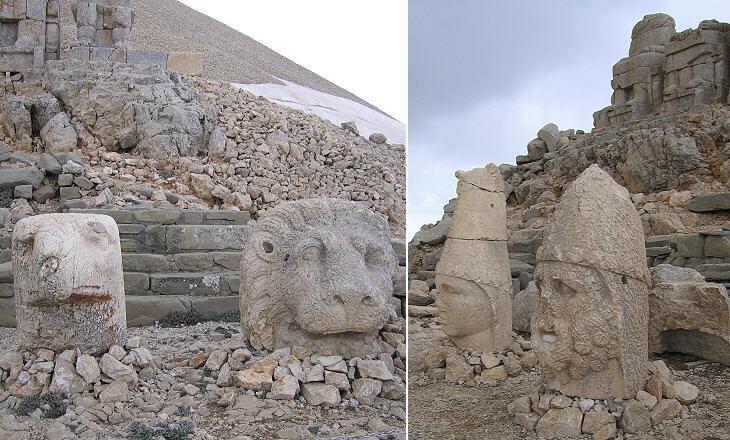 His assistants told him that they knew nothing about an ancient road, but instead they had seen fragments of gigantic statues on the top of Nemrut Dagi, the highest mountain of the region. Moved by curiosity, or just because he wanted to take some topographical measurements, Sester went to see by himself; he reached the peak of the mountain where he discovered several broken statues. At Urfa two gigantic columns were traditionally attributed to Nimrod (Nemrut in Turkish), the biblical founder of Babylon and for this reason the locals (the mountain is not so far from Urfa) thought Nimrod had petrified his enemies and placed their heads at the top of the mountain (Turk. dag). 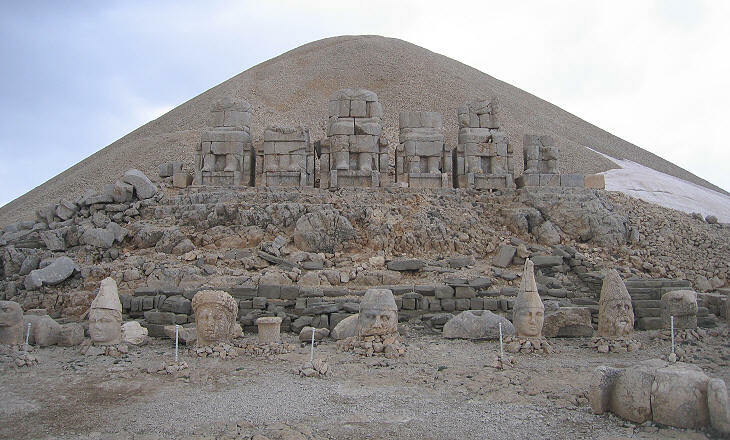 In the following year Karl Sester returned to Nemrut Dagi; he was accompanied by archaeologist Otto Puchstein and together they started the first scientific research and excavations. They found a very long Greek inscription on the back of the thrones upon which the statues stood; it provided almost all the information we have about the purpose of this monument which resulted in the tomb (built for himself) by Antiochus I, King of Commagene. 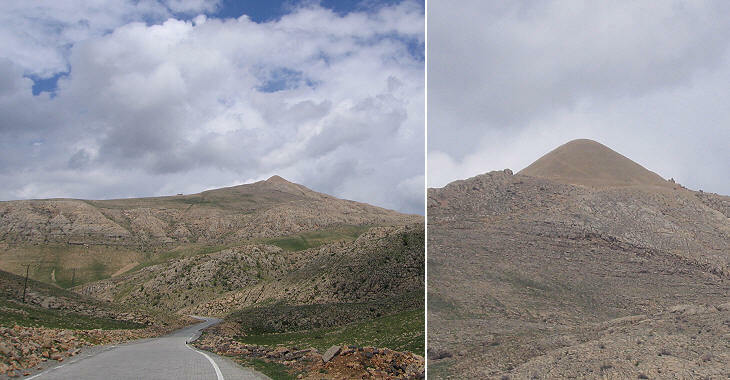 Today the peak of the mountain (7,000 ft) is bare rock and its conical tip consists of stones having the size of a fist, but in antiquity it was covered by forests. The design of the funerary monument was influenced by astronomy; two identical terraces face the East and the West, as if to mean that gods (and King Antiochus) exert their power over the entire world and see everything which humans do; the terraces were accessed via a smaller terrace on the northern side of the mountain (it was covered by still solid ice in mid May 2009). Antiochus I ruled over Commagene from 70 to 38 BC: he described himself as "friend of the Greeks and friend of the Romans", but he should have added "and friend of the Parthians too" because his kingdom was a buffer state between Roman territories (Cilicia was a Roman province) and the Parthian Empire. For this reason he gave to the statues of the gods a Greek and a Parthian name, so Zeus was also Aramazd, the creator divinity of the Zoroastrian faith. The eastern terrace retains the projecting platform which was used during ceremonies. In the inscription Antiochus gave detailed instructions about the frequency, content and financing of these ceremonies; the main ones took place on his birthday and on the anniversary of his accession to the throne; the ritual sacrifices were followed by a two day banquet during which the priests were told to generously fill the cups with good wine. The size of the two main terraces indicates however that the number of participants in these ceremonies could be large, but not enormous. The statues consisted of several blocks of stones which were roughly sculpted with the exception of the highest one (covering shoulders, neck and head) which was more carefully designed. 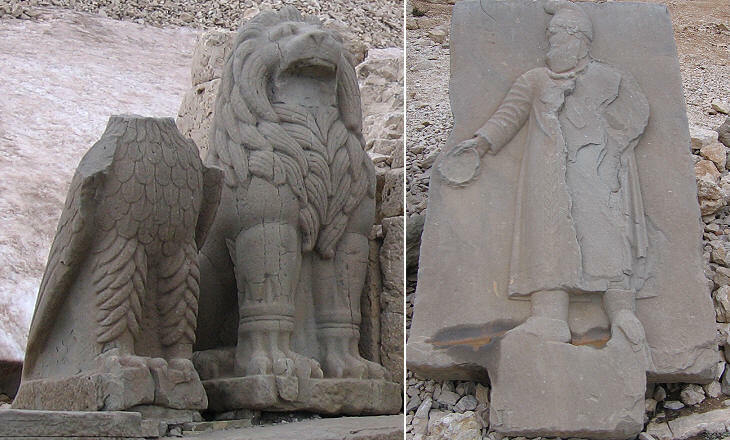 The statues of the gods and the king were flanked on each side by two others which portrayed an eagle and a lion. The eagle is a traditional symbol of authority and in this particular case it was seen as the messenger of the gods. The lion is portrayed in a standing position which symbolizes its role as guardian of the site. The conic hat worn by the four male figures is more typical of Persia than of Greece. Antiochus ordered that he be portrayed as a young man, probably at the age he had been when he became king, because his accession to the throne coincided with his deification. King Antiochus had not only to deal with the opposite pressures of Romans and Parthians, he also had to choose with whom to side during Roman civil wars: Pompey acquired a great prestige in the region by eradicating the pirates from the coasts of Cilicia and Antiochus provided troops to him when he was at war with Caesar; he managed however to escape Caesar's vengeance as he was regarded as a loyal ally of Rome. 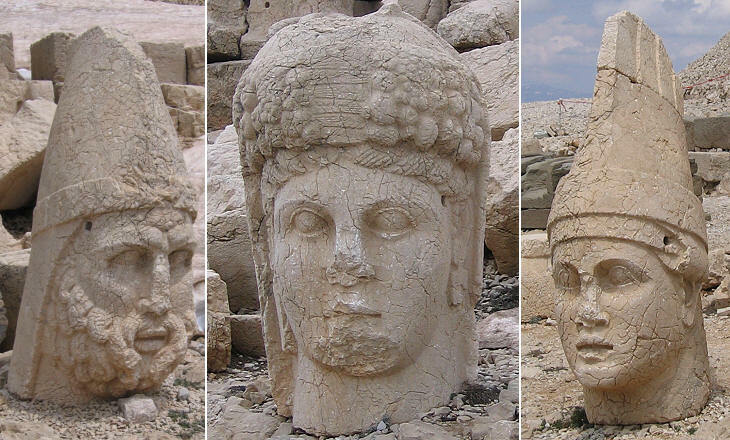 Another example of the balanced policies followed by King Antiochus is the fact that he claimed to have both Macedonian (Greek) and Persian ancestors, who were portrayed in equal measure in reliefs which completed the decoration of the terraces. Laodice, the first daughter of Antiochus, married King Orodes II of Parthia and this helped Antiochus in retaining good relations with the Parthians. In the inscription at Nemrut Dagi he made an indirect reference to his difficult job: All along my life I regarded the devotion to gods as my most important asset and the source of the greatest joys; (..) thanks to this belief, I miraculously escaped great dangers, I overcame very difficult situations and I enjoy a long and happy life. The portraits of Zeus and Hercules are very similar and the same can be said for those of Apollo and King Antiochus. 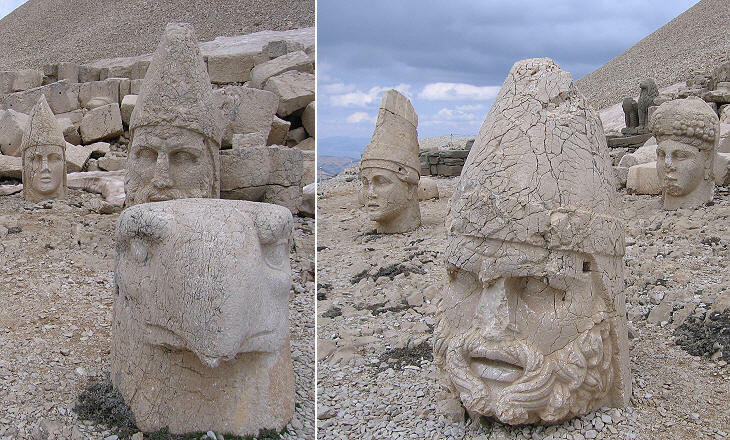 It is generally thought that the heads fell because of earthquakes, wind and extreme weather conditions; however the noses could have been broken deliberately as an insulting action towards false gods by early Christians or Arabs. The statues represented more than one deity; the portrayal of Hercules was mainly based on the traditional iconography of his Persian counterpart; the female figure represented the kingdom of Commagene, but also the goddess of fertility and the statue of Apollo was also a personification of Helios and Mithra. Commagene was in touch with civilizations which had elaborate religious beliefs and King Antiochus did his best to amalgamate them. The actual site of Antiochus's tomb inside the conical mound between the two terraces has not been found yet.